ALL PRODUCTS MADE IN U.S.A.
B27-IMZ Life Size Silhouette Paper Shooting Targets - 25"x38"
Sight Seer Red - Paper Bullseye Shooting Targets - 19"x25"
HALO Life-Size Silhouette Reactive Shooting Targets - 12.5"x19"
Center-Fire Life Size Silhouette Paper Shooting Targets - 19"x25"
When you couple our ultra bright shooting targets with our attractive, space efficient, and FREE cascading displays, you get a target line that sells through over and again. Thompson Target also builds in healthy margins for our wholesalers. Now you can increase your profit while offering competitively priced, high quality products to your demanding customers. 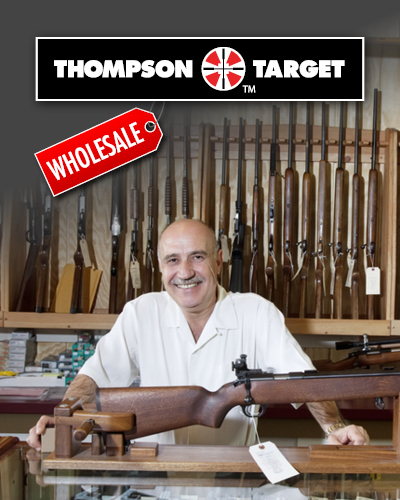 Build on your reputation as the area’s premier shooting destination with high quality Thompson Targets. If you’re looking for a shooting target supplier with uniquely designed quality printed targets, fast order turnaround time, and FREE FREIGHT (orders over $500), you’ve come to the right place. Plus, we’ve managed to LOWER our bulk price on nearly every category and introduced extended tiered pricing across all categories in 2018! *Wholesale programs available to commercially zoned full-time brick and mortar retail establishments and shooting ranges open to the public. I am very impressed with this target. It is exactly what I have been looking for. I have been looking for this type of target for a long time. Glad I finally found it. From the first time I used these for 15 yard practice I have been satisfied. It is easy to see shots and know my patterns. The best I have used. Just tried out these new targets, and couldn't be more pleased...I'll be ordering a LOT more of these targets! These targets are life savers due to the fact that you can adjust your shot from the firing line without walking down range. Excellent product, get some today! I've used every type of target but this one is perfect. Just the right size, easy to see, and easy to see my shots. I buy them for me and my friends. The quality,and consistency of your targets are unmatched in my opinion. Your fast shipping and customer care makes a good product even better. I plan on using these targets for many years, I couldn't be more satisfied!